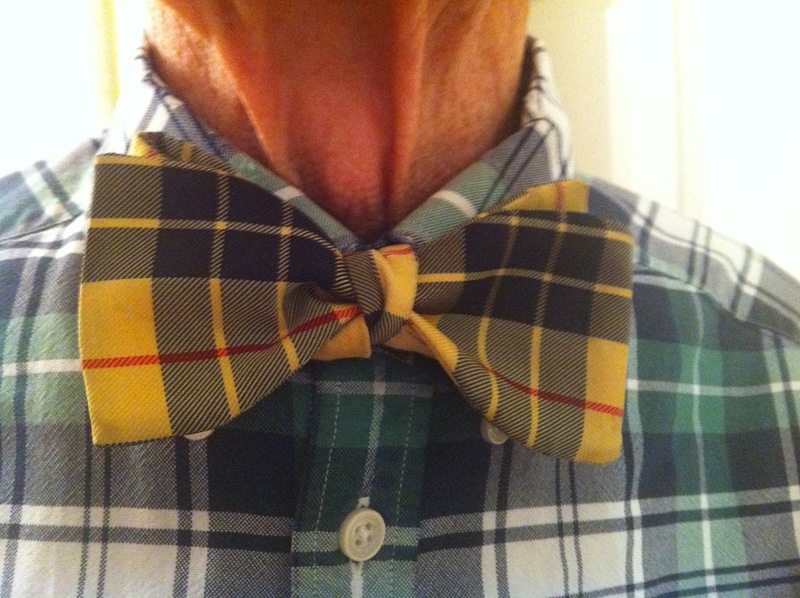 The Font of Knowledge: The Bow Tie (or more vulgarly described as the Dickey Bow). The Bow Tie (or more vulgarly described as the Dickey Bow). The Bow Tie was rarely worn when I was young in Dublin, only on special occasions such as dances in the Gresham and the Shelbourne Hotels. Modesty forbade me to wear one on other less formal occasions. It was seldom seen in the streets or houses of Dublin at the time but I admired its tidy shape and its many variety of colours. 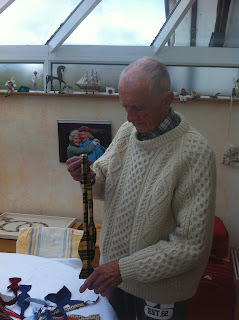 When I went to London to the National Heart Hospital in 1946 as part of my post graduate training, I met another Dublin man older then myself. He was Walter Somerville who came originally from the North Circular road in Dublin and I first met him when he had returned from the war and had been appointed a junior consultant in the National Heart Hospital. He always wore a bow tie and he had a clean and open shirt appearance and his apparel had the effect of attracting a second look. As a physician, or one in training, it was customary to dress well and formally when dealing with patients – nowadays of course, one wears “scrubs” for hygiene reasons. When examining patients it was necessary to examine other organs as well as the heart and chest. At the time I was opposed to the use of the waistcoat and I found it was embarrassing to be wearing a loosely fitted tie particularly when dealing with young females, as it interfered and touched off the patients abdomen. It occurred to me how efficient the bow tie was under these circumstances. 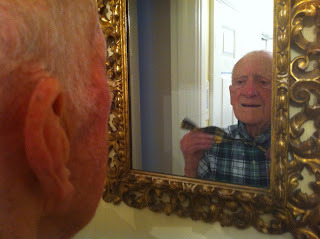 So almost from the day I met Walter, I began to wear a bow tie, and I rejected the long and dangling loose tie. It is perhaps surprising that since that time I never wore an ordinary tie except at a funeral, and fortunately these were rare occasions. 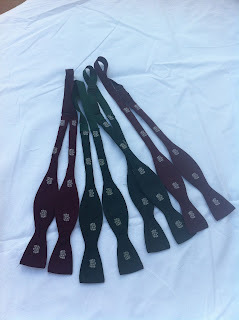 Milltown Golf club centenary bow tie. Learning to use a bow tie is not easy, and is certainly a good reason why they are not in more popular use. There are different types of bow ties, those that are made up from scratch, tied in the front, and tightened from the back – the “real” bow tie – this tie has to be dealt with carefully and skilfully and in most circumstances is slightly imperfect in shape but all the better for it. Then there are those that have already being made up and are clipped at the back. This tie is easily recognised by its almost false tidy sharpness – the “cheats” bow tie - and finally there are those that are already made up and clipped to the shirt front - the “blasphemers” bow tie – they have few friends! On a slight aside, on one occasion at a bow tie competition, the winner took exactly 12 seconds to complete a “real” bow tie – an odd coincidence because it was also the exact same 12 seconds required after a regatta, for a young Trinity student to finish a pint of Guinness without spilling a drop from lifting the full glass until he put it empty back onto the table! The Bow Tie was also valuable as a marker within the professions as well as elsewhere. 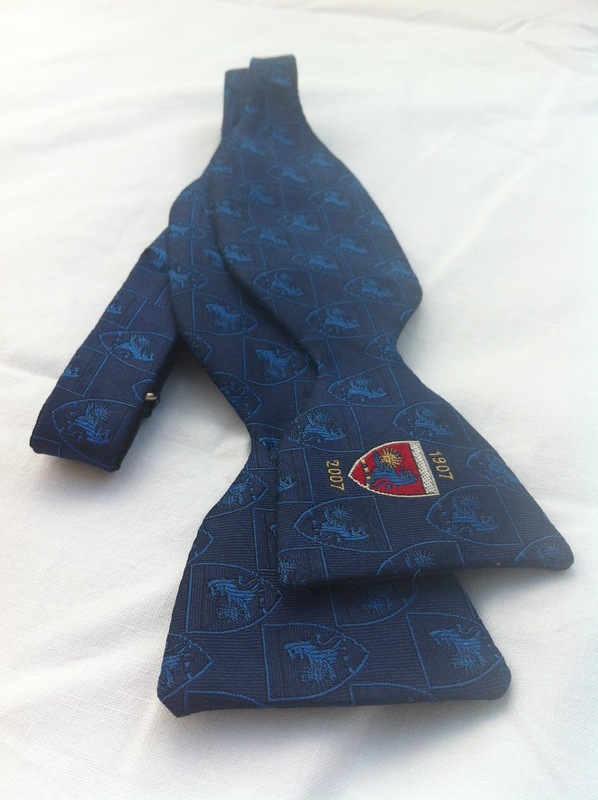 Some organisations/clubs had bow ties with the club crest on them and there was a certain satisfaction in being recognised as a member of the organisation concerned. The Royal Society of Medicine had a fairly small and neat bow with the letters of the logo of the organisation clearly visible. Thus it was easy to meet a colleague and to feel a close interest in the membership. For many years in London, that bow tie was well known and regarded but sometime in the late 1960’s or early 1970’s I got wind from a friend that The Royal Society of Medicine intended to do away with the tie. With this information I visited the headquarters of the organisation in Harley Street and I enquired about the availability of the bow tie. They confirmed that they intended to discontinue its use. They were in dark green or dark red. I asked about the continual availability of the tie and on searching the drawer they stated that only five green and one red were still available. To the girl’s surprise, I bought the lot so that they were clear of further bow ties. 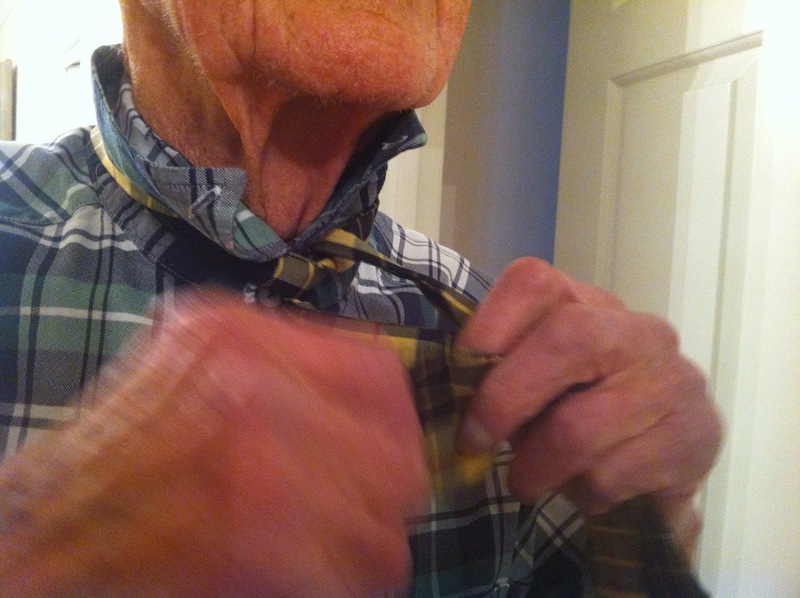 The bow tie when properly tied will exist for many years if correctly looked after. 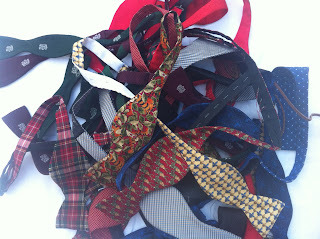 I still have many bow ties available to me. My son Hugh had some stitched into a counterpane, providing a rather wide and perhaps bizarre picture in the bedroom. I continue to use a bow tie on my less occasional visits and meetings outside the home. 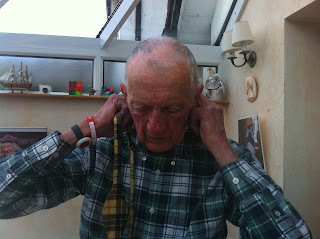 Recently I was surprised when visiting my Milltown annual dinner that I had some difficulty in tying it properly. But I eventually achieved that nice, casual, carelessness which is a feature of a properly tied bow tie. It was certainly well identified as one of my peculiarities in my early days but I overcame the embarrassment of being a perpetual bow tie wearer. In fact, it might have become a source of comment to others if it was missing during ward rounds and/or other areas. It is true to say that there are few people with the patience and the capacity to learn the skill of making the bow tie and therefore we shall continue almost certainly to be a rare breed indeed. I owe my very happy and fruitful period working with Risteárd to my own fondness for bow ties. I had started wearing them as a 21-year-old music teacher, in an attempt to look older than my years and so maintain an air of authority with my pupils. 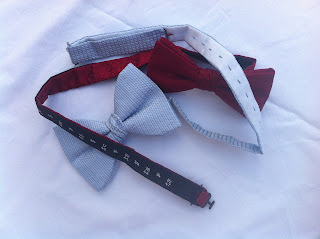 I favoured floppy velvet bows which were, I am ashamed to admit, dickey bows rather than proper bow ties. 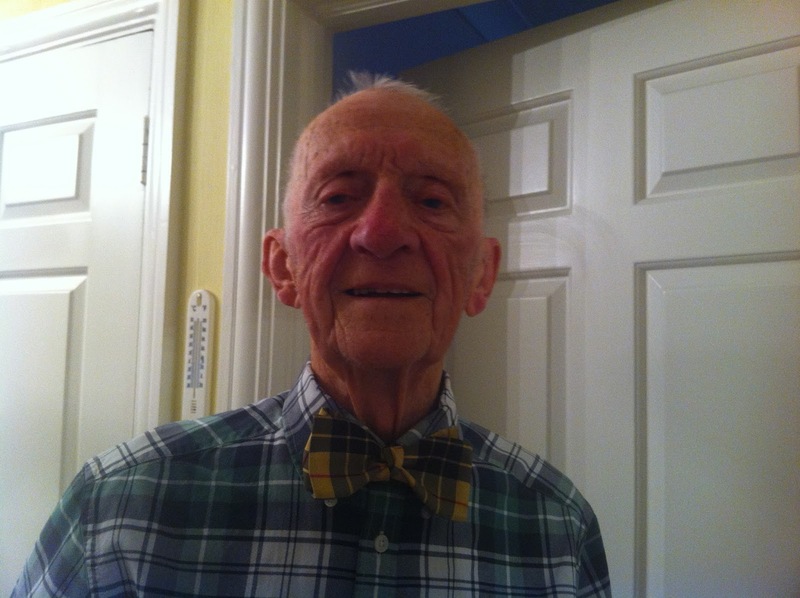 When I arrived in St Vincent's hospital, Risteárd became curious about me, as we were the only two people to wear bow ties, and he asked someone who I was. And shortly I found myself working in his research team. I am ashamed to admit that I still cannot tie a proper bow tie, and admire those who can.